“In 2007, the University of Alabama at Birmingham (DAB) and its affiliates completed three important, large- scale strategic planning efforts. Together, these processes generated a ‘blueprint for our research future’ that lays the foundation to transform our substantial clinical and translational research enterprise through integration and innovation across all disciplines, schools, and our health care system,” says the University of Alabama’s abstract for its Center for Clinical and Translational Science on the NIH RePORTER. The Center for Clinical and Translational Science received a $5.1 million award last year. Lab suppliers working to sell lab equipment and market life science solutions in Alabama may want to take a closer look at the University of Alabama’s funding statistics. In 2012, the NIH awarded the University of Alabama $207.4 million. For a full list of schools receiving funding from the NIH at the University of Alabama, please visit the NIH website. The NSF also awarded the University of Alabama $6.1 million in 2012. For more NSF funding statistics on the University of Alabama, please visit the NSF website. 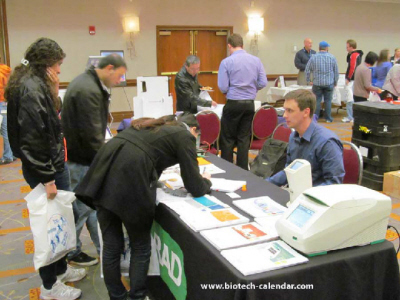 If you are a lab supplier interested in marketing your life science solutions and working to sell lab equipment at Alabama life science marketing events, Biotechnology Calendar, Inc. invites you to attend our annual Birmingham BioResearch Product Faire™ Event on November 14th, 2013. Last year, the Birmingham BioResearch Product Faire™ Event attracted 336 attendees, of which 64 were purchasing agents, professors and post docs, and 62 were lab managers. The visitors came from 33 different research buildings and 45 departments across campus. Biotechnology Calendar, Inc. is a full-service science research marketing and events-planning company that organizes life science marketing events at top research universities across the country. If you’re interested in marketing your life science solutions and working to sell lab equipment at life science marketing events closer to home, we encourage you to view our 2013 calendar of events. For more information on the Birmingham BioResearch Product Faire™ Event, or to view more detailed funding statistics on the University of Alabama at Birmingham, click on the button below.